Good morning everyone!! Thank you so much for checking in today!! 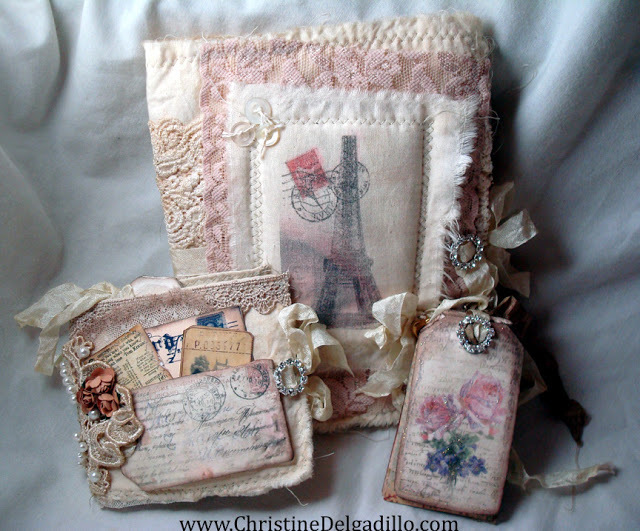 I wanted to share some inspiration this morning to give a BIG shout out to a friend who is one of the featured designer's for Creative JumpStart Summit 2012, Christine Delgadillo. She has been teaching all over the Bay Area and I am so amazed and inspired by her. Check out her Blog by clicking here and show her some love. There's a Giveaway underway and you don't want to miss out on it. If you haven't heard about Creative JumpStart, you need to sign up and watch all those great techniques!! You will not be disappointed. Check out Christine's Project using Crystal clear spray to transfer images on different mediums. For more photo's and information on these projects, well simply go on over to her Blog! She uses OUR products and lots of vintage laces which is absolutely stunning.